Beautiful design features complemented by flawless craftsmanship & accessories are why people say that Fred Rose is simply the best. We've been renovating bathrooms in Sydney since 1970 and since then we've seen some big changes in the designs & available options for bathrooms including premium spa baths, custom designed sinks, and LED lighting to provide extra ambiance at night. We have access to a wide range of stylish modern accessories and our Master builders are responsible for some of the best custom bathroom renovations Sydney has ever seen. 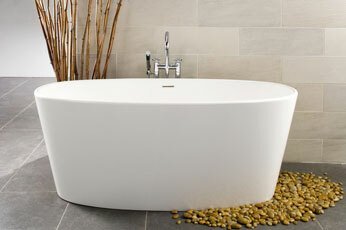 Stylish high quality bathtubs that provide comfort & long lasting gloss. Wide selection available including regular, oval, free-standing, and corner bath tubs to suit various bathroom configurations in either stone, steel, ceramic or acrylic. Ceramic bathroom basins, sinks and mixer taps from the Caroma & Dorf inspired range including modern and contemporary designs catering for all styles & budgets. All taps are made with high quality internal components. Custom designed showers with a wide selection of water saving shower heads crafted in various design & colour combinations. Custom taps & soap dispenser holders, hand showers, glass frosted screen panels and much more. Beautifully crafted bathroom vanities and storage solutions built with quality materials to resist wear and tear. Our designers will provide you with the best solution for you and your family to provide extra space and years of enjoyment. There's nothing better than relaxing in your spa bath after a long day's work in your perfect Zen environment. Large range available including oval, rectangle and corner spa baths with the latest European designs. Create the perfect environment in your bathroom. We have ambient lighting options to create a stunning environment together with heating options to keep you comfortable with increased ventilation to resist the build up of moisture. The bathroom toilet now offers variety of new features including personal cleaning stations and bidets. We install the latest ergonomically designed toilets with a range of design options to suit custom bathrooms. Add style and finesse to your Sydney bathroom with a range of trending features including heated towel rails & racks, laundry shoots, anti-fog mirrors, stainless steel robe hooks, cosmetic mirrors, shower shelves and much more. Our bathroom ensuite renovations will give you the peace and freedom that you need during the morning household rush hour with your very own beautifully styled bathroom. Make sure you ask us about our exceptional package deals. At Fred Rose we only use durable premium quality bathroomware & product suppliers. Reputable trustworthy brands such as Caroma & Dorf, Fowler & Palmers Glass are among a few of our prestigious suppliers. Visit one of our Sydney showrooms where you can see a fantastic showcase of display bathrooms that you can touch & feel before committing to a decision. Our customers love our professional friendly service and we can't wait for chance to show you more of the same. We love our new bathroom. We would like to thank all of your team for the great work they performed and the professionalism they showed throughout the job. You guys now come highly recommended on our list. Thank you for making the whole renovation process easy for us and making sure we had minimal downtime. Our entire family loved the custom features you added for us and we couldn't ask for more. I can't express my gratitude enough for how happy I am with our new bathroom. I would also like to express my kind thanks to all of your staff members for their friendly attitude, thank you very much! Our team is standing by to handle your enquiry. As one of the largest bathroom renovation companies in Sydney we take pride in perfoming amazing craftsmanship that will last a lifetime. Don't just trust any company with your custom bathroom renovations, Go with Fred Rose & go with the best.